The true “Green Wave”: Solidarity with Colombian workers in occupation in BP! 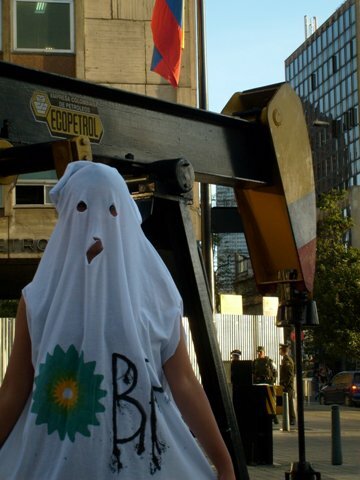 SHAME ON BP â€“ DESTROYER OF HUMAN RIGHTS IN CASANARE! UNION RECOGNITION FOR USO NOW!Â Â Â MEET COMMUNITY DEMANDS! Bring banners, placards and letâ€™s make a noise! Construction workers at the BP plant in Tauramena, Casanare, ColombiaÂ Â have been in occupation since 21 May. Labour Guarantees for the Workers. These workers are part of theÂ MOVIMIENTO POR LA DIGNIDAD DEL CASANARE / MOVEMENT FOR THE DIGNITY OF CASANARE which has been fighting BP since January this year and presented a Petition of Demands to the corporation on 23 March in Casanare, and again at its Annual General Meeting in London on 15 April. The petition includes proposals and demands in five areas: environment, human rights, social investment, labour and the supply of goods and services.Â Â The workers and the community demand a collective agreement and proper recognition for the national oil workersâ€™ union USO. The struggle was launched with a strike from 22 January, which ended 30 days later with the promise from the Corporation to enter talks. Talks were established through five negotiating commissions. The problem is that it takes two to negotiate! From the start BP tried to decide who would be the community representatives, but it had to withdraw this when a letter signed by three thousand community members named their representatives for each commission. But BP has not shown interest in the process. In the commissions BP has not listened, it effects not to be interested in the labour problems and the crises of the Casanare region. Meanwhile the corporation initiated a publicity campaign of disinformation in the community. “There has been a wave of death in Casanare ever since oil production began in the early 1990s. Some six thousand people have been assassinated and three thousand people disappeared in the department. Every time there have been complaints or protests in opposition to BPâ€™s interests, the community leaders concerned have been killed. This indicates an elimination strategy of violent social control. 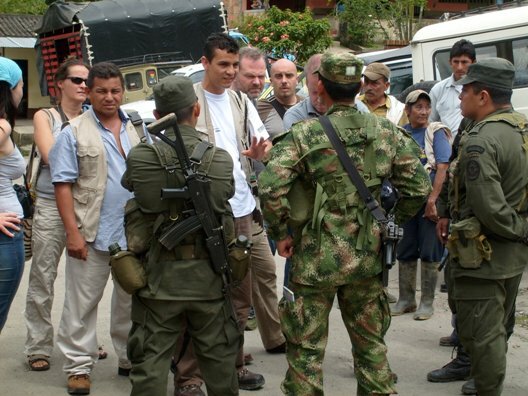 The agents have been the military and paramilitary groups. The Colombia Solidarity Campaign demands that BP recognises the workers just demands and that it sits down with them immediately and the Movement for the Dignity of Casanare to restart the talks process. 1. Send protest messages to BP demanding the corporation conducts peaceful negotiations with USO and the community representatives of the Movement for the Dignity of Casanare, meeting their just demands and guarantees no victimisation of union members. 3. Join our picket of BP HQ in London, or wherever you are, organise and take action to protest against BP and send us reports.